President Uhuru Kenyatta addresses a rally recently. Courtesy photo. President Uhuru Kenyatta is poised to win next month’s presidential poll with more than 50% according to the most recent opinion poll. The poll conducted by Infotrak Research and Consultancy firm placed President Kenyatta ahead of opposition candidate Raila Odinga with about a month to the election. 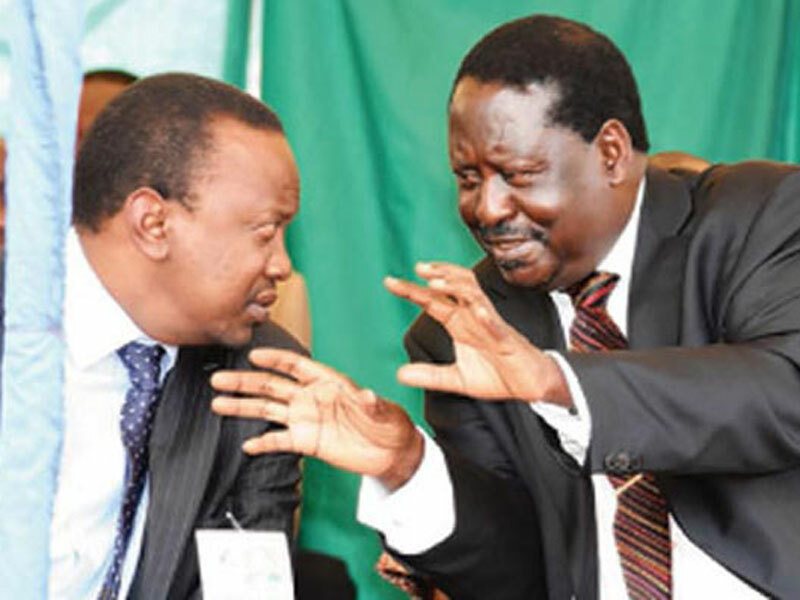 The survey released Friday gives Uhuru 48 per cent and Raila 43 — if elections were held today. Undecideds stand at eight per cent. This means that if Uhuru and Raila split the undecideds Uhuru wins. For Raila to be victorious, he would have to win all the undecideds, a less likely scenario. On Tuesday this week, a poll by the Radio Africa Group research department placed Uhuru at 48 per cent and Raila at 39 per cent. The NASA leader remained upbeat on Friday as he campaigned in Migori where he said Jubilee had no campaign agenda and was only following NASA ‘s footsteps with the intention of erasing the latter’s gains. According to the poll by Infotrak, Uhuru would win if elections were held today. But what is likely to leave the two candidates and their think tanks pondering strategy and tactics is the eight per cent who haven’t made up their minds. NASA candidate Raila Odinga campaigns on Friday. Courtesy photo. There are 19.6 million eligible voters in the IEBC register. This means more than 1.5 million voters are undecided about which of the eight candidates to choose. The poll that sampled 2,000 registered voters was conducted on June 24-25 with +/- 2.2 per cent margin of error. The survey suggests Alliance for Real Change candidate Abduba Dida would garner 0.5 per cent while Ekuro Aukot of Third Way Alliance, Cyrus Jirongo of the United Democratic Party and independent Joseph Nyagah would each get 0.1 per cent. “One thing is for sure, the election is going to be a two-horse race[between Raila and Uhuru,” Infotrak CEO Angela Ambitho said. There is also the possibility of Kenya’s first presidential run-off, if no candidate secures 50 per cent plus one vote in the first round. According to Infotrak, Uhuru and Raila would each secure victory in four of the former eight provinces. Uhuru would win in Central Kenya by 90 per cent, Rift Valley 56 per cent, Eastern 58 per cent and Northeastern 75 per cent. However, he would only secure 29 per cent at the Coast, 28 per cent in Western, 14 per cent in Nyanza and 41 per cent in Nairobi. Raila would win Nyanza by 83 per cent, Western 53 per cent, the Coast 61 per cent and Nairobi 51 per cent. However, the poll indicates the former Prime Minister would secure only 37 per cent in Eastern, 20 per cent in Northeastern, 34 per cent in Rift Valley and five per cent in Central. Analysis of undecided voters indicates Raila’s perceived bastions have the largest population of don’t-know-yets. For instance, 18 per cent of registered voters in Western and 9 per cent of voters at the Coast say they don’t know who they want for President. Ten per cent of undecideds are in Rift Valley and 6 per cent in Nairobi. Five per cent undecided voters are in Central and Eastern and three per cent in Nyanza. In 2013, Uhuru won with 6,173,433 votes against Raila’s 5,340,546. Uhuru got a major boost from turnout in his bastions. Where he won, he won big — averaging 86 per cent of the vote share. Raila’s average vote share in the 27 counties he won was 70 per cent.